SpaceWeather: New (2010 June 3!) Impact on Jupiter? Re: SpaceWeather: New (2010 June 3!) Impact on Jupiter? Bad Astronomy: BREAKING: Another Jupiter impact? The state of the impactor is already known: A rocky body and not, like the last two, a cometary object. The lack of a ring around the impact site, caused by the low density of a comet, tells us this impactor was solid as far as the lower cloud decks. Wayne wrote: The state of the impactor is already known: A rocky body and not, like the last two, a cometary object. The lack of a ring around the impact site, caused by the low density of a comet, tells us this impactor was solid as far as the lower cloud decks. The first body seen impacting Jupiter was SL9, an obvious comet. The second, last year's impact recorded by Wesley, was probably asteroidal, not cometary. It is too early to say what this latest was (and it might never be known). Depending on angle and speed, both cometary and asteroidal material could burn up before reaching any deeper cloud layers where their residue might help characterize them. I wonder what the time scale of the flash was. Can lightning be positively ruled out? One thing that would further indicate a solid object striking is dark cloud markings. The first body seen impacting Jupiter was SL9, an obvious comet. The second, last year's impact recorded by Wesley, was probably asteroidal, not cometary. The Moment Jupiter Got Slammed, In Color! t may be three days after Anthony Wesley spotted the huge fireball in Jupiter's atmosphere, but I'm still buzzing. To see the massive gas giant get slammed by a chunk of space rock or ice (or both) is a historic event. After all, the world was only treated to Jupiter eating a comet once -- the 1994 break-up and impact of comet Shoemaker-Levy 9. But Thursday night's fireball was actually Wesley's second Jupiter impact sighting (another amateur astronomer, Christopher Go of the Philippines, confirmed the event); his first was the astonishing impact aftermath 'bruise' in the Jovian atmosphere in July 2009. He didn't actually see that impact, but he was the first to see the huge Pacific Ocean-sized scar the impact rotate into view. Although it was thought the 2009 impact was caused by a comet, scientists using Hubble Space Telescope data announced (also on Thursday, bizarrely) the 2009 impactor was likely a 500-meter wide asteroid instead. And now, to showcase his most recent discovery, Wesley has published a color image of Thursday's impact event, showing the location of impact very clearly. After a bit of image processing and a combination of RGB (red, green and blue) images, he produced the wonderful photograph above, showing off details in Jupiter's banded atmosphere and exact location of the fireball. If the object that crashed into Jupiter on June 3 left behind a bruise, it’s a tiny one. No ground-based telescope has found evidence of a scar. But an image taken June 6 with the sharp eye of the Hubble Space Telescope may provide the final say. With observations planned months in advance, “Hubble taking a look at anything on short notice is not a trivial matter,” Hammel notes. “A lot of people worked overtime this past weekend with virtually no warning in order to enable a Hubble look.” In scheduling the snapshot, researchers had to contend, among other factors, with interference from Earth’s moon. Stay tuned, Hammel says, to find out what Hubble saw—or didn’t see. On June 3rd, 2010, something hit Jupiter. A comet or asteroid descended from the black of space, struck the planet's cloudtops, and disintegrated, producing a flash of light so bright it was visible in backyard telescopes on Earth. Soon, observers around the world were training their optics on the impact site, waiting to monitor the cindery cloud of debris which always seems to accompany a strike of this kind. bystander wrote: The Moment Jupiter Got Slammed, In Color! WOW!!!! - A fight in outer space... i wonder who won? ____ Any one know what the rules are? bystander I couldn't find that you already posted this. Detailed observations made by the NASA/ESA Hubble Space Telescope have led researchers to believe that the flash of light seen on Jupiter on 3 June was a meteor. This visitor from space did not plunge deep enough into the atmosphere to explode and leave behind any telltale cloud of debris, as seen in previous Jupiter collisions. Hubble’s sharp vision and ultraviolet sensitivity were used to seek out any trace evidence of the aftermath of the cosmic collision (right inset). 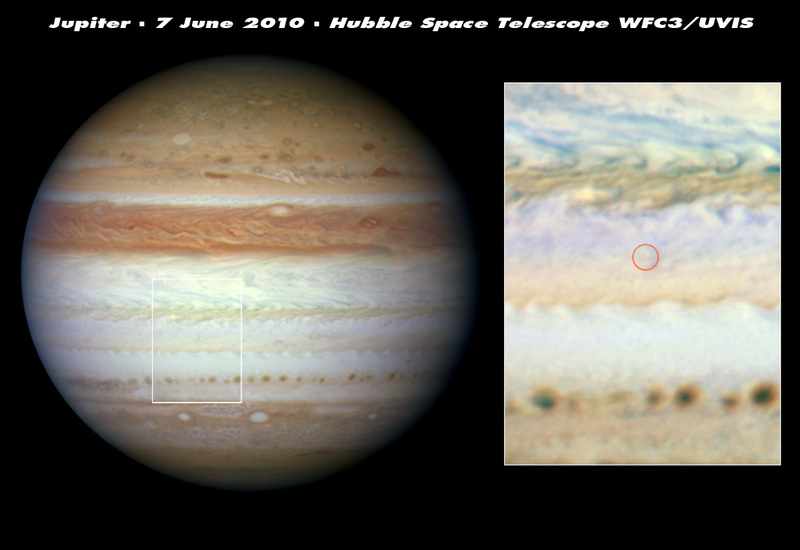 Images taken on 7 June show no sign of dark debris above Jupiter’s cloud tops. This means that the object didn’t descend beneath the clouds and explode as a fireball. If it had, dark sooty blast debris would have been ejected and would have subsequently settled down onto the cloud tops. New and detailed observations from the NASA/ESA Hubble Space Telescope have provided insights into two recent events on Jupiter: the mysterious flash of light seen on 3 June and the recent disappearance of the planet’s dark Southern Equatorial Belt. At 22:31 (CEST) on 3 June 2010 Australian amateur astronomer Anthony Wesley saw a two-second-long flash of light on the disc of Jupiter. He was watching a live video feed from his telescope. In the Philippines, amateur astronomer Chris Go confirmed that he had simultaneously recorded the transitory event on video. Wesley was the discoverer of the now world-famous July 2009 impact. Astronomers around the world suspected that something significant must have hit the giant planet to unleash a flash of energy bright enough to be seen here on Earth, about 770 million kilometres away. But they didn’t know how just how big it was or how deeply it had penetrated into the atmosphere. Over the past two weeks there have been ongoing searches for the “black-eye” pattern of a deep direct hit like those left by former impactors. The sharp vision and ultraviolet sensitivity of the Wide Field Camera 3 aboard the NASA/ESA Hubble Space Telescope were used to seek out any trace evidence of the aftermath of the cosmic collision. Images taken on 7 June — just over three days after the flash was sighted — show no sign of debris above Jupiter’s cloud tops. This means that the object didn’t descend beneath the clouds and explode as a fireball. If it had done, then dark sooty blast debris would have been ejected and would have rained down onto the clouds. The sharp vision and ultraviolet sensitivity of Hubble's Wide Field Camera 3 were brought to bear on seeking out any trace evidence of the aftermath of the cosmic collision. Images taken on June 7 — just over three days after the flash was sighted — show no sign of debris above Jupiter's cloud tops. This means that the object didn't descend beneath the clouds and explode as a fireball. "If it did, dark sooty blast debris would have been ejected and would have rained down onto the cloud tops, and the impact site would have appeared dark in the ultraviolet and visible images due to debris from an explosion," says team member Heidi Hammel of the Space Science Institute in Boulder, Colo. "We see no feature that has those distinguishing characteristics in the known vicinity of the impact, suggesting there was no major explosion and fireball." Obviously, I was posting it at the same time you were.